For applications using medium pressure 2-stroke propulsion, it is possible to benefit from the higher BOG pressure in the fuel gas line. Cryostar’s patented system using BOG as the working fluid in a semi-open cycle. This allows superior exploitation of residual cold in the process to reduce the power consumption, while still returning excellent results for condensate recovery efficiency. 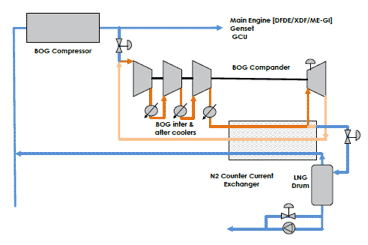 Utilizing a BOG compander, together with a JT valve, the system remains simple, and has no major effect on the primary design of the fuel gas system. The complexities of nitrogen inventory are avoided and the system can be easily integrated into vessel cargo systems.